Instead, a slightly sloped discharge pipe should run underground, a minimum of 10 feet, to daylight where possible (and to a drywell or drain field when not possible). Things sometimes go wrong, however, because drain lines are sometimes susceptible to freezing, especially when you live in Tennessee and Kentucky. Are you worried that your discharge line might freeze over when the temperatures drop? Frontier Basement Systems can help prevent wintertime freeze-up of discharge lines. The specially engineered IceGuard® system solves the problem of frozen discharge lines to provide you with a reliable waterproofing system even during the coldest temperatures. IceGuard® is a perfect solution to sump pump discharge lines in Tennessee and Kentucky. Contact us today for a free installation estimate. If you live in the Middle Tennessee, Southwestern Kentucky, Greater Nashville area where the discharge line from your sump pump is susceptible to freezing in the winter, consider installing our anti-freeze device called IceGuard. It will allow discharged water to escape if the drain freezes (or clogs for any reason). 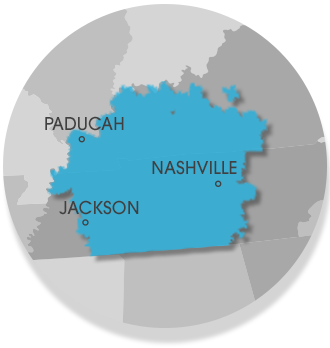 waterproofing products to homeowners all throughout Middle Tennessee, Southwestern Kentucky, Greater Nashville, including Clarksville, Nashville, Jackson and cities nearby. Contact Frontier Basement Systems today for a free cost estimate to have the IceGuard® anti-freeze discharge device installed in your home today.